There's something unsettling about Daedelus's music. It's this feeling that something is breathing below the surface. Even when the artist is simply laying down music tracks for other artists to rhyme or sing over, Daedelus has a way of mixing old samples, found sound, and quirky instrumentation into a signature form that is both curiously alien and mildly familiar. Like an electric amusement park in slow motion, Daedelus best represents what could be the binary dreams of computers after their human counterparts unplug and shutdown for the night. Over the last three years, Weisberg-Roberts has released a slew of material that runs the gamut of musical genres, typically blurring the boundaries between, say, hip-hop and electronica, or whatever his project maybe at the moment. With recent exceptional work such as his genre-evading 2002 LP 'Invention' or his left of center hip-hop work with The Weather (a group also featuring Busdriver and Radioinactive), Daedelus has had a busy release schedule. Now, with even more projects on the horizon, Weisberg-Roberts continues to perplex his audience while maintaining his reputation as one of the most talented, if hard to pinpoint, artists to come out of Los Angeles. 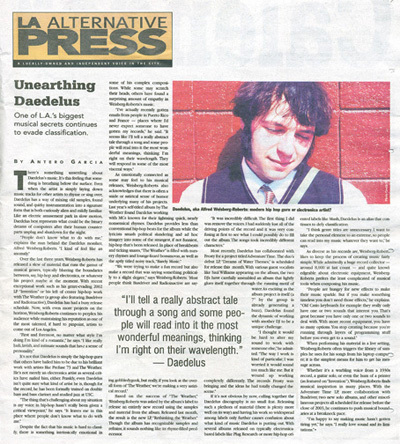 It's not that Daedelus is simply the hip-hop guru that others have hailed him to be due to his brilliant work with artists like Prefuse 73 and The Weather. He's not merely an electronica artist as several critics have nailed him, either. Frankly, even Daedelus isn't quite sure what kind of artist he is, though for the record, he has been formally trained on double bass and bass clarinet and studied jazz at USC. Despite the fact that his music is hard to classify, there is something intrinsically emotional in some of his complex compositions. While some may scratch their heads, others have found a surprising amount of empathy in Weisberg-Roberts's music. Based on the success of 'The Weather,' Weisberg-Roberts was asked by the album's label to release an entirely new record using the samples and material from the album. Released last month, the result is the new LP, 'Rethinking the Weather.' Though the album has recognizable samples and refrains, it sounds nothing like its rhyme-filled predecessor. Most recently, Daedelus has collaborated with Frosty for a project titled Adventure Time. The duo's debut LP, 'Dreams of Water Themes,' is scheduled for release this month. With various guest vocalists like Saul Williams appearing on the album, the two DJs have carefully assembled an album that lightly glues itself together through the running motif of water. As exciting as the album project is itself (a 7' by the group is already generating a buzz), Daedelus found the dynamic of working with another DJ to be a unique challenge. If it's not obvious by now, culling together the Daedelus discography is no small feat. Releasing such a plethora of material (there is plenty more well on its way) and having his work so widespread among labels only further causes confusion about what kind of music Daedelus is putting out. With several albums released on typically electronica-based labels like Plug Research or more hip-hop oriented labels like Mush, Daedelus is an alias that continues to defy classification. 'I think genre titles are unnecessary. I want to take the personal element to an extreme, so people can read into my music whatever they want to,' he says. As diverse as his records are, Weisberg-Roberts likes to keep the process of creating music fairly simple. While admittedly a huge record collector ' around 8,000 at last count ' and quite knowledgeable about electronic equipment, Weisberg-Roberts prefers the least complicated of musical tools when composing his music. When performing his material in a live setting, Weisberg-Roberts often triggers the library of samples he uses for his songs from his laptop computer; it is the simplest means for him to get his message across. Whether it's a warbling voice from a 1930s record, a guitar solo, or even the hum of a printer (as featured on 'Invention'), Weisberg-Roberts finds musical inspiration in many places. With the Adventure Time LP, more collaboration with Busdriver, two new solo albums, and other miscellaneous projects all scheduled for release before the close of 2003, he continues to push musical boundaries at a breakneck pace.